Many of the products we sell here at Federal Hospitality Equipment are built and constructed from stainless steel, a choice that provides durability and longevity. If you’re recently purchased a stainless steel product, congratulations! Now here’s a quick guide to maintaining it. Stainless steel, with its unique metallurgical composition, is reputed for its unparalleled anti corrosion quality, compared with other metals. Stainless steel requires maintenance and routine cleaning to look its best, just like any other material, otherwise discolouration may occur. Retaining a sparkling finish on a stainless steel surface only involves a few simple steps. Stainless steel looks its best when it’s cleaned regularly with plenty of water. Sufficient drying is also required so streaks aren’t left behind. You’ll need water, mild detergent, and a cloth or, alternatively, a soft brush. You can use 1% ammonia solution, but never use bleach. After washing, rinse in clean water and wipe the surface completely dry with a soft cloth. On brushed steel you need to follow the direction of the polish for the best results. Always rub stainless steel in the same direction as the grain. Rubbing against the grain will spoil the finish and shine. It can also damage the surface by creating microscopic crevices, where dirt can be collected, which can lead to corrosion. Maintaining stainless steel products also involves knowing the risks and what to avoid. Stainless steel can always be vulnerable to scratching from careless handling or overly aggressive scrubbing. Avoid dragging rough items across its surface and be aware that grit may be trapped under other objects when cleaning. Make sure to be wary of certain salts and acids as certain chemicals can cause discolouration to your stainless steel products. Carbon steel items are another problem to avoid, especially when wet. Ensure you instil rudimentary hygiene and cleaning practices to bypass these potential chemistry issues. Never rub or scrap your products with steel wool, plastic scorers or use concentrated bleach/acid-based cleaning products. Remove any stick labels or adhesives as soon as possible. Gentle heat from a hair dryer or a glue gun can generally soften the glue for easy removal, or you can warm stainless steel pots/pans in an oven before peeling off labels. Eucalyptus oil-based cleaners also work wonders in removing adhesives. Depending on the circumstance of the scruff, mark or issue it can take a few different methods or products to safely have your problem erased. 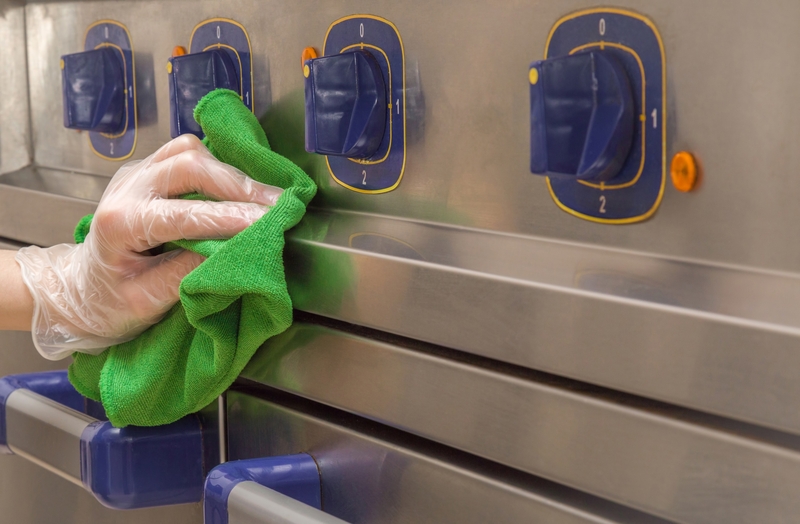 It’s already been addressed earlier on what the general method of cleaning stainless steel is, but sometimes there’s special cases that require a little extra effort. If rust occurs on your product apply cream cleaner with a soft, damp cloth and rub gently. It might be necessary to use proprietary stainless-steel cleaner if this mark won’t shift. These cleaners are usually made with dangerous chemicals, so extreme care is required. After cleaning it’s important to neutralise the acid with baking powder solution or 1% ammonia, then rinse with clean water and wipe dry. If rust has worn away part of the surface don’t despair! This can be remedied with professional polishing, but it’s important to get advice from an expert before undertaking this method. If paint damage has occurred you’ll need to apply paint stripper, taking care to follow the appropriate safety instructions. You may need to use a nylon brush or scouring pad, but avoid metal scrapers at all costs as they’ll damage the surface of your product. Heavy limescale from hard water can be loosened by soaking in hot water and 25% vinegar solution. Rinse well with a solution of baking powder or 1% ammonia and then clean with water. Always make sure to wipe the surface dry. Cement and mortar splashes will need to be washed off before they set. Mild acids such as vinegar may be required, but never use products that contain chloride rich chemicals. Never use brick cleaning liquids as they contain hydrochloric acid and be wary of any loose particles while you’re cleaning, as they may damage the surface of your machine or product. Stainless steel wool scouring pads are available for heavy duty work, like removing burnt food from steel saucepans. They’ll scratch the surface, but won’t leave fragments to go rusty. If you’re looking for some well-built, multi-functional and durable stainless steel products, you can browse our range here. You can also contact us directly for advice on what stainless steel products would be suitable for your business, or if you require help regarding general cleaning issues in relation to your new purchases.